Charlie McCarthy started life as a block of wood. 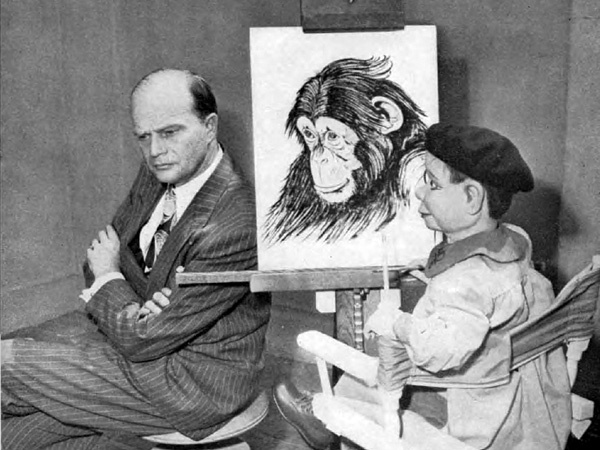 At the request of Edgar Bergen--who was a ventriloquist--a carpenter carved a dummy based on a kid Bergen knew. Charlie and Bergen had a very successful career in show business beginning on the stage, moving to radio, movies, and, eventually, television. In some ways, Charlie was almost real. When Bergen's real life daughter appeared on his show, she was introduced as Charlie's little sister. Because he was heard on the radio, many people did not know that Charlie was a ventriloquist dummy and not a real person. His personality was so vibrant, it is like he was a completely separate person. You can find recordings of Charlie and his human, Bergen, on Old Time Radio. Listen to a sample show and check all of the shows you can get on the four-disc set.